Share the post "39 Les Roches Students introduced in Eta Sigma Delta Honor Society"
39 Bachelor of Business Administration (BBA) and Bachelor of Science (Bsc) students of Les Roches International School of Hotel Management were introduced in the Eta Sigma Delta International Hospitality Management Society (ESD). The 39 students, who are only a few weeks ahead of their graduation, represent the top 20 percent of their classes at Les Roches, one of the best hospitality management schools in the world. Les Roches plays a key part in the history of the ESD Society. In 1978, a group of students from the University of New Hampshire’s Whittemore School of Business and Economics identified a need to recognize hospitality and tourism students for outstanding academic achievement, exceptional service and demonstrated professionalism. 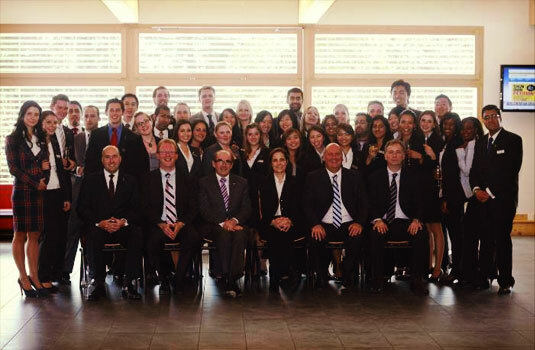 Les Roches entered the Eta Sigma Delta International Hospitality Management Society in 2002 and is only one of the three hospitality management schools in Switzerland with an ESD chapter. There are over 60 active Eta Sigma Delta chapters throughout the world. During the ceremony, all 39 students were introduced to the ESD Society by taking oath. An important part was lighting five candles for the five pillars of the ESD Society: Excellence, Leadership, Creativity, Service and Ethics. The ceremony was fully organized by the students themselves. The 39 names of the 2011.1 ESD students are engraved on the ESD ‘Hall of Fame’ board at Les Roches. The following students were introduced to the ESD Society: Sophie Le Baux, Itzel Vargas Romero, Julia Kerschbaumer, Katharina Kluschat, Giovanna Farcug, Uriel Burak Dryjanski, Nitin Abbi, Ibraheem Arif, Nadine Beglinger, Matthew Booth, Zack Chen, Mercy Cheung, Stephen Chien, Cassie Chiong, Elis Darsono, Malin Ekeman, Stephen-Oliver Ellis, Susanna Este, Claudius Gutzwiller, Ajay Harjani, Jonas Hoffmann, Wangui Wanja Kahoya, Karan Kumar, Daniela Nicole Kunz, Annie Lai, Karma Lam, Oscar Ljung, Bhavna Nandwani, Terry W. Ng’ang’a, Artittaya Ruensumran, Denise Richter, Bishakha Shrestha, Jaideep Singh, Ted Jian Sun, Nikita Wadhwani, Olivier Wentzke, May-Yee Wu, Ekaterina Zolotova, Alessandro Pätow.